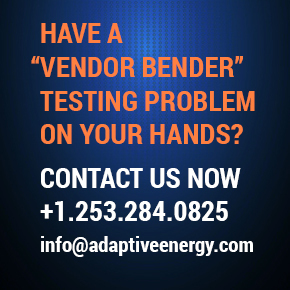 When organizations need more than just off-the-shelf systems, when they need a creative problem-solving approach to address a complex testing challenge, and when they need it NOW, they know Adaptive Energy is the partner to turn to for innovative and effective rapidly deployed solutions. Whether helping research and development teams with pre-release testing and refinement, working with quality engineers to analyze safety and reliability, or supporting production managers who need to balance performance and cost in day-to-day operations, Adaptive Energy’s experts create integrated solutions that work for each diverse set of customer needs. Adaptive Energy doesn’t provide cookie-cutter systems, we roll up our sleeves alongside your engineers, analyze your requirements and product specifications, and collaborate to develop the right non-destructive testing solution to suit your needs. With our expertise in design, imaging, materials, and fabrication, we help you get it right—before your products get to market. You can’t afford to have inconsistencies in production, defects in materials, flaws in workmanship, or deviations from precise specifications. Adaptive Energy’s non-destructive testing solutions help organizations assess and refine critical component characteristics, fabrication processes, and testing parameters to keep your production running smoothly and ensure that your output meets quality and performance requirements. The systems we build are intuitive to use and don’t require expensive maintenance contracts, helping you keep costs in line over the entire lifecycle of your products. When quality is mission critical, when there’s no room for error, when your customers demand the best, when the public depends on you to keep them safe—Adaptive Energy can devise ongoing testing solutions, systems and procedures that prevent failure and keep in-service equipment functioning effectively. We assess, plan, execute and manage each of our projects to exacting standards, providing our customers with testing solutions that perform as required even under rigorous, repeated use. We’ve produced solutions that help organizations comply with a broad range of industry specifications such as ASTM, ASWE, AWS, API, DICONDE and more.